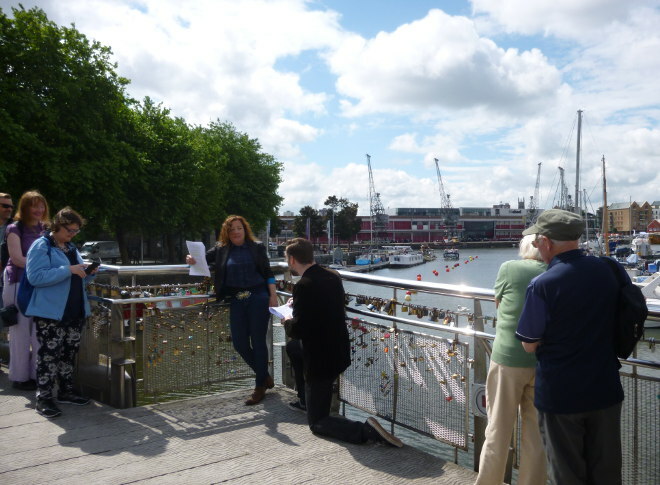 During the #FlashWalk on National Flash Fiction Day, ten fantastic flash fictions were shared, all inspired by Bristol Harbour and the surrounding area. Several have already been published elsewhere, but here is an exclusive opportunity to read four thought-provoking and wonderful tales. I walk with Mother along the harbour side. Calm. Quiet. 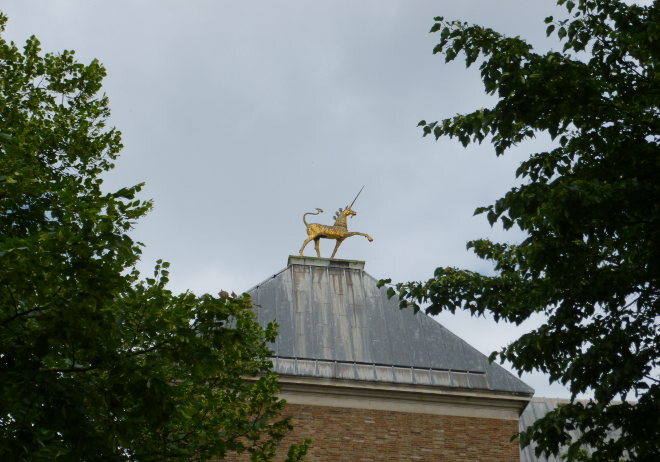 Galleons stand tall above us. I see him then. The boy. Men standing round him. Holding him. I walk with Mother. Slowly. Her skirts swish the cobbles. Her bonnet nods. Her parasol shields us from the bright sun. I watch. Sloshing water slops over him. Showers his dark skin. He stands. Still. They plunge the bucket again. And again. Chuck the water. Hard. He stands. Still. Mother clutches my hand and I walk on. She still nods to friends. Smiling. I look back. They drag his dripping body across the wooden deck. Towards that gaping square. They tip him. Trip him. Let him go. His wet, brown body disappears into the black hole. Mother pulls me on. Shows me a shiny penny for a bun. I wonder who he is. What he has done. Where he will go. If he will be raised from that darkness in another harbour. If he will see the sun again. He could have been my friend. You, young man! You look strong, and capable enough of hauling a rope or scrubbing a deck. Best keep an eye on who’s behind you, or you may not see home again. The ‘press men are about, you understand. To beat the tyrant Bonaparte, they have the power to seize any man, any man at all, and press him on to the King’s ships. They took my husband, Johnny Pencloud, fifteen years ago. A fine man he was, eyes as blue as a summer evening, broad shouldered, and hair as black as the coal he used to mine. Mind you, it’s prob’ly grey now. The morning after our wedding, it were. We lay in our warm bed as the sun shone through the window, and listened to the sounds of the people in the street below. ‘Hot coffee! Fresh rolls!’ shouted a hawker. Johnny’s stomach rumbled. ‘I need some of that,’ he said, grinning. ‘Stay there and don’t move ‘til I gets back.’ He kissed me, put on his trousers and shirt, grabbed a pewter jug, and left. I waited till noon, and sunset, and all through the night, but he never came back. The press men were out on the street, you see. How could I go back home without him? So I stayed, doing what I could to pay my way, and I comes down here whenever I can, asking for news about him. I come even on the day our babe was born. And on the day she died, too. So, have you heard of Johnny Pencloud? Nothing is known of you until your twelfth year, when you were purchased by a sugar merchant. You worked on John Pinney’s plantation in the West Indies for 19 years, then accompanied him to Bristol as his personal servant. You had two sisters. You were trained as a barber. You knew how to pull teeth. You visited the West Indies twice after settling in England; after the second visit, it is said you took to drink. You served the Pinney family for 32 years in all, then died around age 45. Then, you slept. Nothing is known of you for the next 201 years. We don’t know where you went, what you dreamt, what has wakened you, but we do know that when you came back to Bristol, something had changed. Now, you are larger than life. 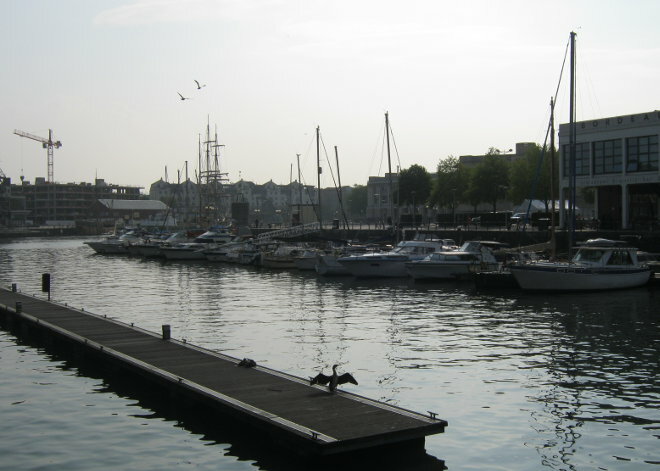 You span the floating harbour. You are raised and lowered by a hydraulic piston. You have grown horns. And we wonder: for what have you returned? How long will you suffer the footfall of living men? Are you still bound by the grasp of the River Frome, or will you someday free yourself from the line of the river still known today as St Augustine’s reach? With her stiletto jammed in the cobbles, she tried to perfect the laidback office worker look, munching on her panini whilst leaning against the stone pillar. Nobody had warned her about the cobbles and she was wishing she had trusted her instinct to wear flats on her first day. At the business park, lunch used to be powdery soup in the corner of the canteen, trying to look interested in a magazine while avoiding eye contact with everyone, especially the creepy Mr Summers. Now she had fresh air, seagulls, cheerful crowds and pavement artists. Polishing off her lunch she gave one final twist of the heel and her shoe was freed. Dignity intact, she moved from the shadows into the sunlight and looked over the shoulder of the guy chalking. It looked just like her hometown. It was her hometown. It was unmistakable with the castle in the background and the church spire just in front. She was about to ask him if he was from there too when she noticed he was working from a small photo. It was of herself walking through the high street. Not herself now but herself ten years before, holding hands with her old flame, Matthew. It was next to another photo. She was at her local park on a swing as a child, laughing as her sister pushed. In the next, she was at her graduation. The bass beat from the waterfront bar seemed to be pumping right through her body as she moved round to get a better look at the artist, frantically searching for some kind of familiarity. She must have gone to school with him, lived near him or something, she thought. He was at least twenty years older than herself with small dark eyes, unshaven and had receding hair. She had never seen him before. As she tried to form the right words he turned to look directly at her and placed a finger on her lips. “A picture’s worth a thousand of them don’t you think?” he said. Last Saturday, writers, readers and interested passersby got involved into the celebrations for National Flash Fiction Day 2016. I was part of the team organising events (led by Kevlin Henney and along with Freya Morris and Tino Prinzi) in my home city of Bristol, and had a blast! The day kicked off at 10.30am outside Bristol Central Library for the first ever Bristol #FlashWalk. 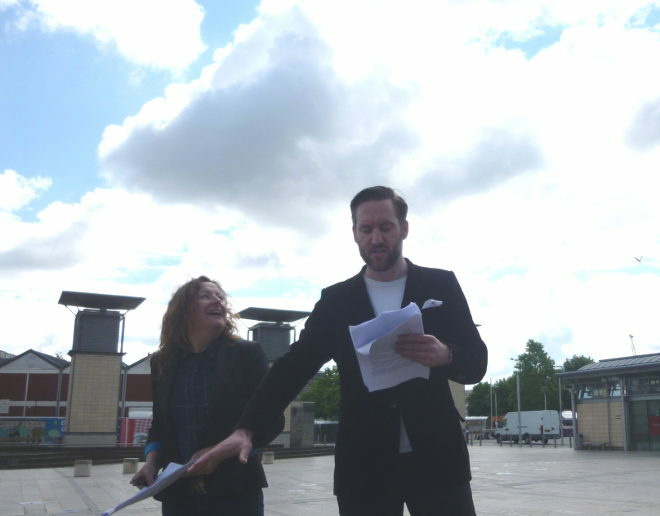 Writers from across the UK had submitted tales inspired by our harbour area, and some wonderful stories had been selected for actors Jo Butler and Tom Parker to perform. 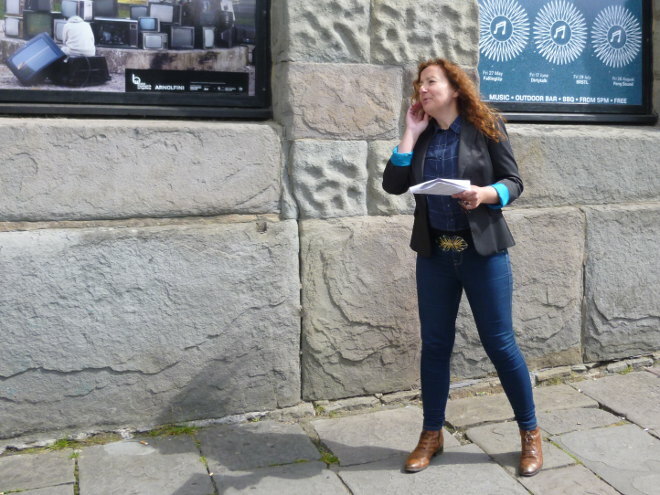 We began with the spine-tingling The Harbour Festival by AA Abbott, read by Jo Butler under an ornate archway leading down to the waterfront. 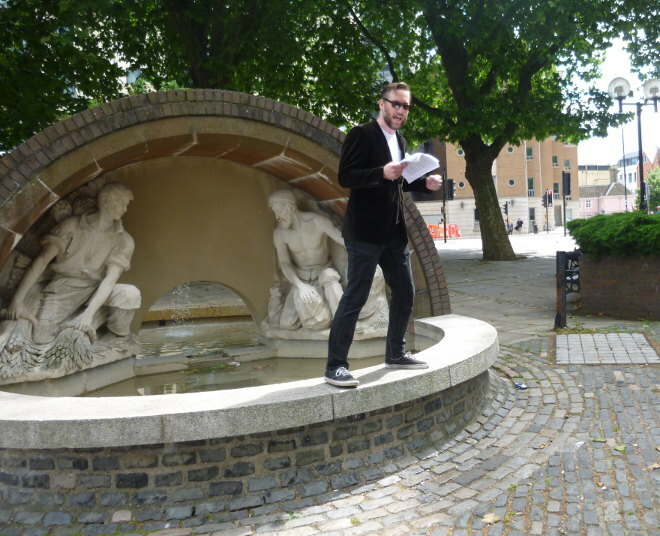 Tom followed this with Diane Tatlock’s Harbouring Friendship, and then we made our way to Millennium Square, where Jo performed Juliet Hagan’s Johnny Pencloud, a thought-provoking tale of the women left behind in the days of press-ganging. My story Altitude followed, with both Tom and Jo taking a role to share the dizzying story of a lad encouraged to climb a crane by an adventurous and reckless lass, and then regretting his lust-driven choice! On Pero’s Bridge by Holly Atkinson could take place nowhere other than actually on Pero’s Bridge, followed aptly by Ingrid Jendrzejewski’s emotive Your Name is Pero, telling the tale of the little slave boy the bridge is named for. On the corner by the statue of John Cabot, Dolphins by Lucho Payne gave us a moment of light and hope. Then came Gemma Govier’s intriguing A Thousand Words, followed by Lynn Love’s gorgeous Will There Be Pirates. The morning wrapped up outside St Nick’s Market, with Mark Rutterford’s Singing Out Loud, leaving us with the satisfaction of a potential happy ending. The sun shone throughout, the actors and writers were wonderful, and the audience well behaved – we even picked up a few more folks along the way! 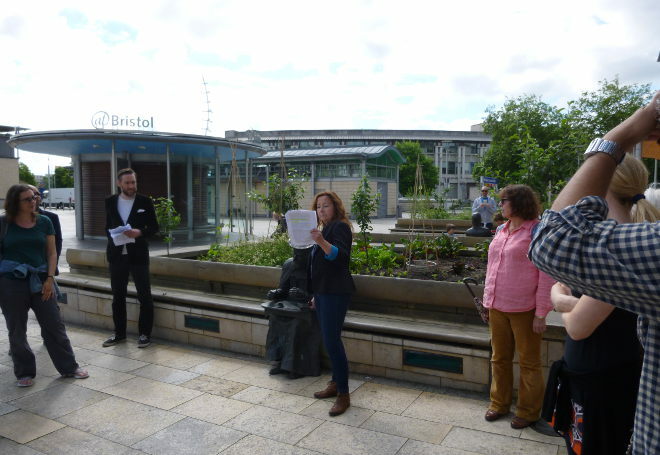 Next came a free flash fiction writing workshop back at Bristol Central Library, where KM Elkes made us regard strawberries in a whole new light, and Alison Powell armed us to create extraordinary similes. 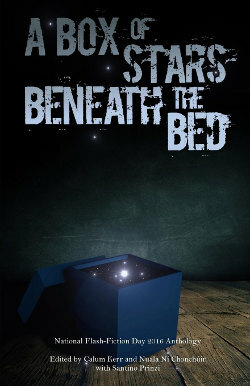 At 7pm, events moved to At The Well for an evening of flash tales with the father of NFFD, Callum Kerr, and the launch of this year’s beautiful NFFD anthology, A Box of Stars Beneath The Bed. Thirteen readers, masses of stories, and countless emotions! The orangutan story by KM Elkes still haunts me. A fabulously inspiring night to finish a truly splendid day. Ooh, and throughout the day there was the #FlashFlood to enjoy. You can still drop by to read the tales at flashfloodjournal.blogspot.co.uk. Familiar the area in Bristol known as Redcliffe? 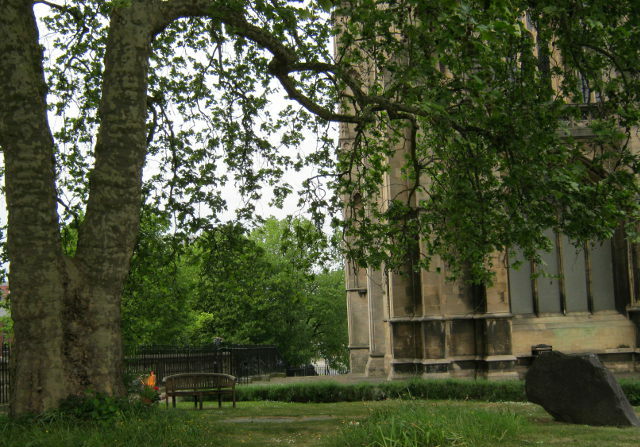 That place with the tower blocks, crimson caves and a remarkably beautiful parish church as grand as a cathedral? 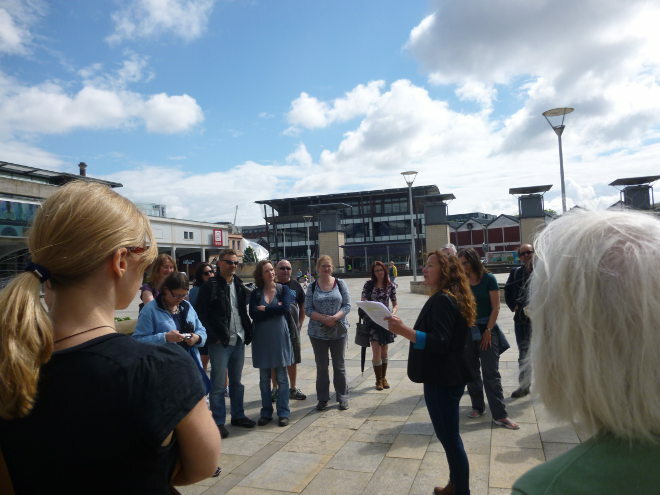 Working with The Redcliffe Neighbourhood Development Forum and Dream of A Shadow, Future Way aims to engage the people of Redcliffe and the wider community of Bristol by using storytelling to challenge the way we view this section of the city. You’re invited to submit a tiny story (split into 3-5 sections of 250-words max) with an immense goal, to re-imagine a corner of Bristol in collaboration with artists, architects and community groups. All genres are encouraged, writers of all experience levels are invited. Entry is free and there’s no limit on the number of entries you can submit. Stories will be ‘tagged’ to locations within Redcliffe in 250-word sections, forming a series of fictional trails to be followed through the physical city. 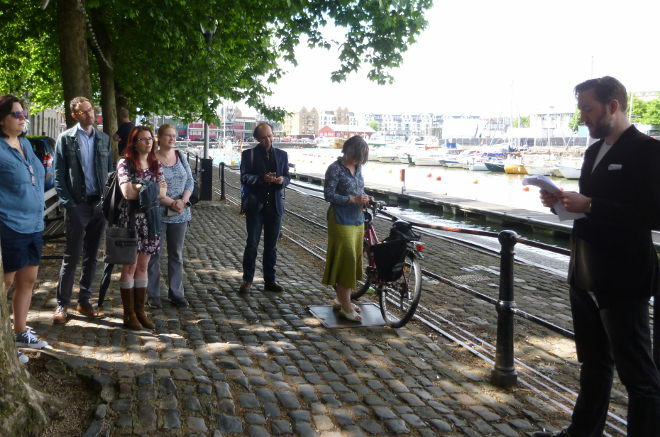 These tags can be scanned via QR codes, revealing a virtual fiction immersing the reader between realities in a format previously used by the Bristol Story Trail. Each section is planned to be tagged to a specific point within Redcliffe, i.e. a wall, lamppost, street, door etc. The deadline for submissions is 12pm, Monday 20th April 2015. Please submit your story together with suggested tag locations for each defined section (photographs would be ideal). Winners will be announced on Monday 27 April 2015. Each selected author’s work will be featured in the Redcliffe Future Way Project and will appear in exhibitions later in the year.